Does the growing power and readiness of judges to question government decisions threaten to unbalance our democracy? When supporters of fox hunting failed to persuade Parliament to drop the Hunting Bill, they turned to the courts. They were just one of a myriad of individuals and groups using the increasingly popular mechanism known rather unexcitingly as judicial review, or JR. But its bland title conceals the fact that the growth of judicial review is perhaps the most revolutionary change in British law over the last thirty years. And it's a massively controversial change. Depending on your viewpoint, it has become either a vital means of shining a light into the dark corners of decision making or a usurpation of the soveriegnty of parliament by unelected judges. Judicial review is the procedure which questions the lawfulness of actions by public bodies - whether local authorities, tribunals, Parliament or the executive. Although procedures differ between England and Wales and Scotland, the underlying legal principles are similar. There has been a rapid expansion in the number of cases brought for judicial review. In England and Wales in 1980 there were 491 cases a year and by 1996 there were nearly 4,000. Traditionally judges could only decide whether public bodies had acted reasonably. But in recent years they have been able to expand their remit into asking whether decisions were fair, as well as reasonable. 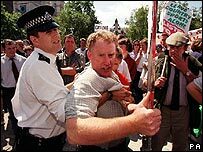 The scope has further increased with the Human Rights Act, which gives judges the power to declare that laws are incompatible with the European Convention on Human Rights. 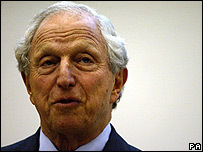 The former Lord Chief Justice, Lord Woolf, adds that the judges may have subconsciously seen themselves as having a role in protecting the public interest during periods of weak parliamentary opposition. This position has infuriated at least one former adversary. "If that's the view that Lord Woolf takes, he should have stood for Parliament, got elected and strengthened the opposition," says the former Conservative Home Secretary Michael Howard. Judicial review necessarily involves adversarial conflict. Lord Woolf suggests another way forward. He says it may be possible for courts to issue "advisory declarations" which would help government ministers decide whether a course of action was lawful in advance. It's an idea that is guardedly welcomed by former Labour Home Secretary David Blunkett. "I would go along with it if the judiciary were to respond in a way that for all sorts of good reasons they weren't prepared to do when I was Home Secretary, which is to look at the intended outcome and contribute to putting it right." Yet all may not be peacefulness and light. The appellate court of the House of Lords is due to be hived off into a new Supreme Court. Richard Gordon QC, who is one of the leading administrative law barristers, predicts that this may embolden the new court to become even more independent than the current Law Lords. According to Michael Howard, that could lead to a corresponding and unwelcome scrutiny of the political opinons of our most senior judges. Law In Action will be broadcast on Tuesday 11 March 2008 at 1600 GMT on BBC Radio 4.